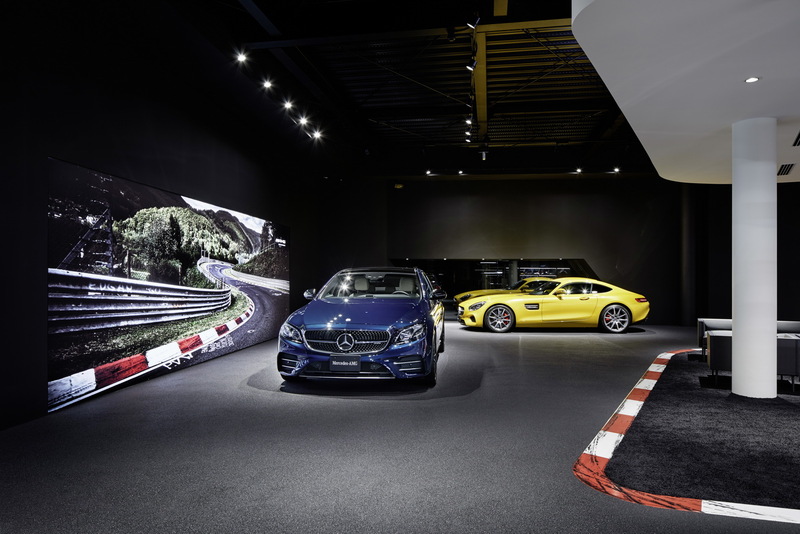 Following its most successful year ever, Daimler’s sports cars division opened the first ever standalone Mercedes-AMG showroom In Tokyo. Sydney will follow. 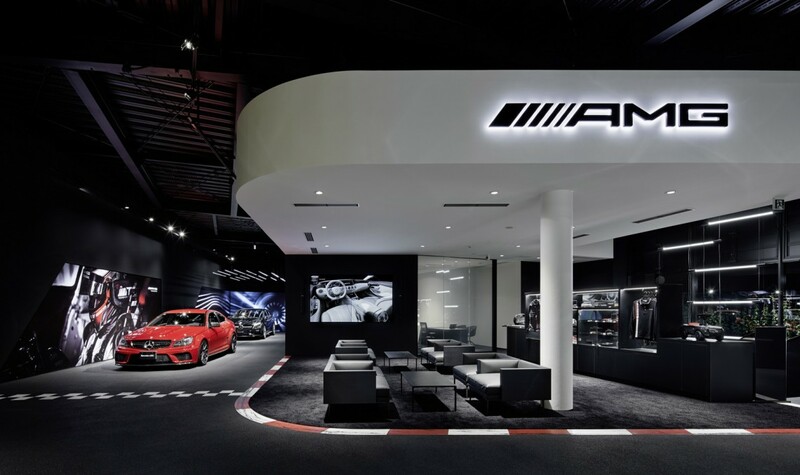 In contrast to the 400 AMG Performance Centers in 40 countries that have been opened since 2008, the location in Tokyo Setagaya is not integrated as a shop-in-shop into a Mercedes-Benz dealership, but is independent and dedicated to Mercedes-AMG alone. The focus in the two storeys showroom is exclusively on the models and themes of the sports car and performance brand. The design of the enclosed structure is modelled after the architecture of the modern company building in Affalterbach and on the AMG “Driving Performance“ brand claim. The highlight of the building’s exterior is a LED façade. During daytime, the white louvres and the diagonal structure provide a dynamic appearance. At night, white-red exterior lighting is activated. Real motorsport situations are staged inside. A deliberately simplified interior design and focused lighting provide the perfect stage for the sports car and performance models from Affalterbach. The new retail outlet features lounges, a boutique, motorsport exhibits, and consultation areas to provide several appealing places for conversations with customers. The vehicle hand-over area is integrated into the showroom and can be flexibly separated to provide customer privacy if needed. The vehicles on display sit on asphalt. The black colour creates an intriguing contrast to the white “arena” on the upper storey. Various road markings transport the racetrack into the showroom. They refer to the roots of the sports car and performance brand, which scored a legendary win with a red AMG 300 SEL 6.8 at the Circuit de Spa‑Francorchamps in 1971. In 2017, Mercedes-AMG celebrates the company’s 50th anniversary, and focuses on the “Driving Performance“ brand promise. 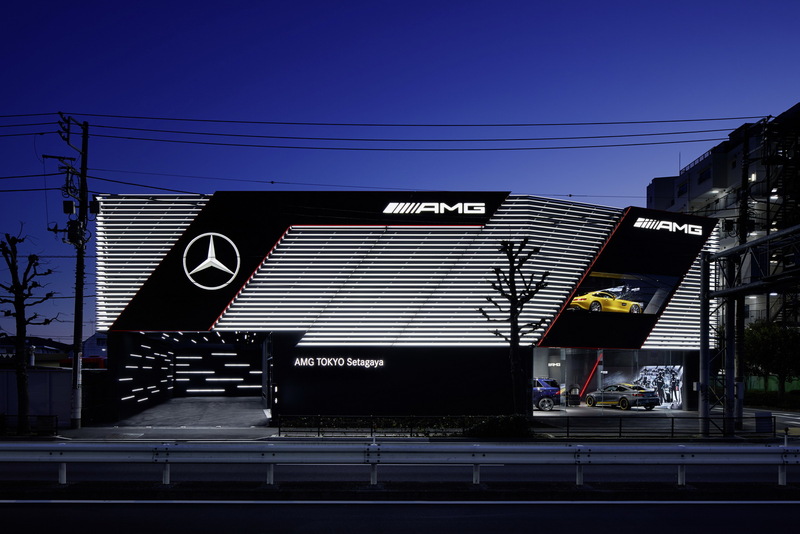 The new independent Mercedes-AMG retail outlet in Tokyo Setagaya serves as a role model for future stand-alone projects in other major cities, which are already on the drawing board. Another dedicated store will open in Sydney before the year 2017 is out.